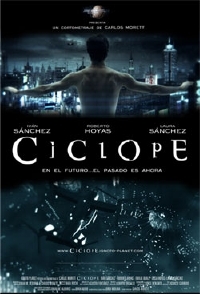 From spanish director Carlos Morett comes a stunning science fiction short called Cyclops. Yes, we've seen this kind of techno-dystopia many times before, but Cyclops looks extremely well made and betrays the filmmakers as having a keen eye for world minutia. Cyclops is set in the future of a new Madrid. It is the story of two policemen who are brothers. It follows the inner turmoil of one of the brothers, suffering terrible nightmares, who begins to question his position in the Police Force, all due to a mistake that will probably haunt the rest of his life. Cyclops stars Ivan Sanchez, Roberto Hoyas, Lucia Hoyos, Emilio Buale and the newcomer in the film world, Laura Sanchez. Exceleeeeent, Minority Report (sorta) en Espanol! Looks great. Reminds me of the Korean movie Natural City. It is actually really well manufactured. I've watched twice already prior to its premiere and it's really stunning.